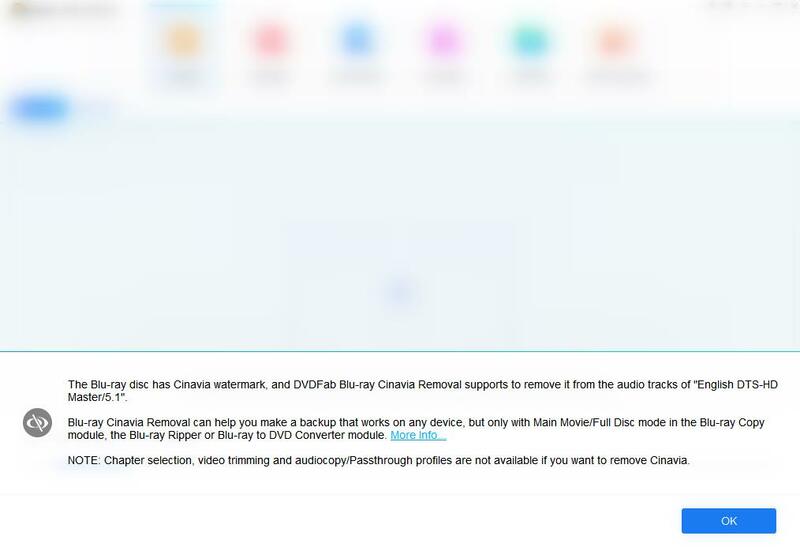 In the Blu-ray Copy option, with the help of DVDFab Blu-ray Cinavia Removal, the audio track affected by the Cinavia watermark, including DTS-HD Master Audio, will be copied as the lossless DTS-HD audio, which equals to the original one in terms of sound quality. While in Blu-ray Ripper and Blu-ray to DVD Converter options, the selected audio track with Cinavia watermark, also including DTS-HD Master Audio, will be converted to various audio formats with high quality output. 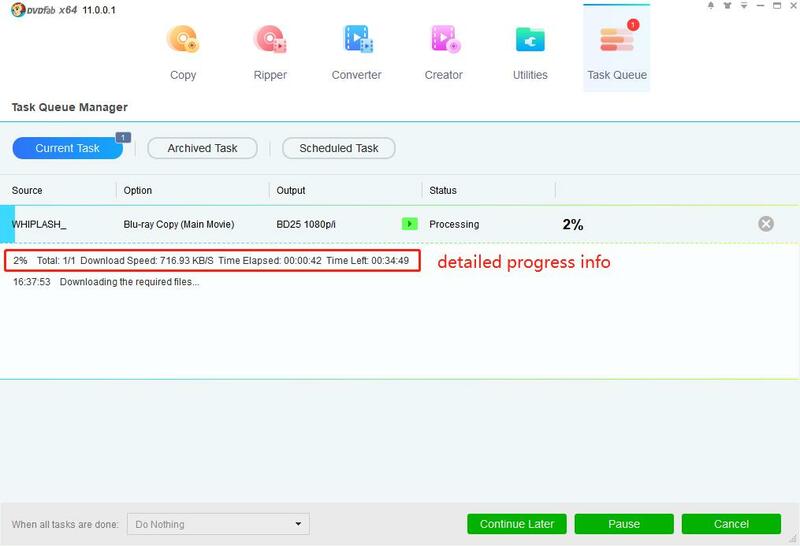 DVDFab Blu-ray Cinavia Removal is integrated in Blu-ray Copy, Blu-ray Ripper and Blu-ray to DVD Converter. For Blu-ray Copy and Blu-ray to DVD Converter users, please refer to Part 1, and for Blu-ray Ripper users, please refer to Part 2. Launch DVDFab 11, navigate to Blu-ray Copy Main Movie/Full Disc mode or To DVD mode, and insert the target BD into the Blu-ray drive for DVDFab to access, or simply drag and drop the source into the main UI for loading if it is an ISO file. If the disc is protected by Cinavia, a window with the message (see below) will appear. Launch DVDFab 11, navigate to Blu-ray Ripper, and insert the target disc into the Blu-ray drive for DVDFab to access, or simply drag and drop the source into the main UI for loading if it is an ISO file. If the disc is protected by Cinavia, a window with the message (see below) will appear. 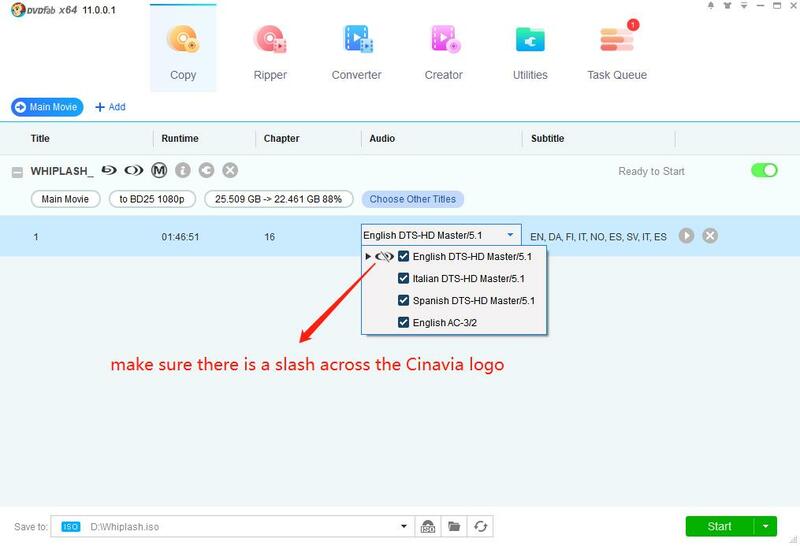 Choose a conversion profile from the built-in profile library, select the Cinavia affected audio track, and at the same time, click on the Cinavia logo until there is a red slash across it, and then choose an output path to start the backup process. 1. Considering the huge data of lossless PCM audio, users can only choose BD 50 or BD 25 at the output size selection box. 3. If there is more than one audio track embedded with Cinavia watermark, you can only select one to remove at a time, at least for the time being.